The Van Gogh Museum has the good fortune of having acquired a tenacious, articulate, unforgiving critic with enough right on his side to teach it a valuable lesson. Whether the museum sees it that way I do not know; I‘m sure that I would not enjoy reading about myself the kind of things that the Dutch-English art dealer Bouwe Jans has published about the museum in his cantankerous book Artquakes and van Gogh. Yet the van Gogh Museum and other arbiters of authenticity do have much to learn from his report. In May 1993, at a minor auction in Groningen, Jans paid 9,000 guilders plus costs for a canvas of 47 x 61 cm. 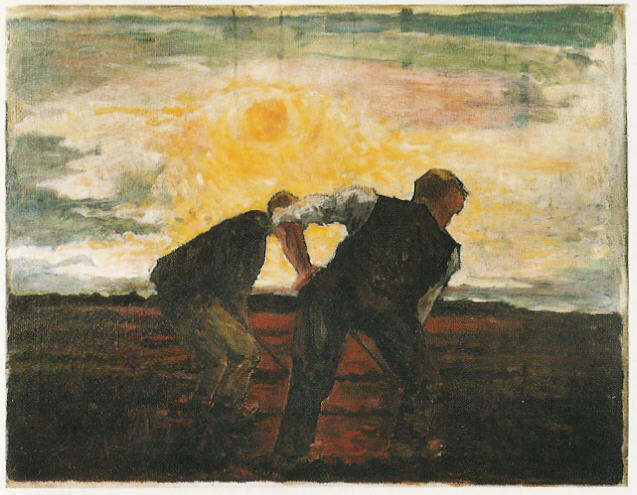 depicting two men digging in a bare field under a low sun. The painting is signed Vincent, in a manner that resembles other van Gogh signatures. The subject was a favorite motif for van Gogh from the beginning to the end of his tragically brief career. Although the painting is unattractive in certain ways, its appearance is not incompatible with the look of early paintings by van Gogh. In The Hague and Drenthe, where he worked from December 1881 to November 1883, van Gogh drew and painted agricultural workers in an unassuming style, with mixed results. The hypothesis that Jans’s Diggers is a rediscovered original work from this period is not contradicted by the materials or provenance of the painting. The burden of proof, it seems to me, is on those who would deny that the painting is by Vincent van Gogh. The Van Gogh Museum does not agree. The attitude of the museum, as reported by Jans (the museum will undoubtedly respond with its own version of events), corroborated the cynical opinion of it held by the Groningen auctioneer. When Jans asked him whether he had submitted the painting to the judgment of the Van Gogh Museum before the sale, he said he had not because “the Museum’s answer was always ‘No’ anyway.” This is not a desirable way for a museum to come across to the trade or the public. Even if the Van Gogh Museum is approached an average of five times a week by hopeful owners, and even though few genuine van Goghs are discovered in this way, the museum should judge each submission with an open mind. In fact, materials submitted this way form an invaluable archive of non-van Goghs. A well-produced statistical report of the results would allow the museum to say not simply Nyet to an owner, but to place a proposed object in a specific, dated niche: a copy or reproduction of a known work, a pastiche, a possible forgery, and that rarest of categories: a probable original. The list should include a category called “ inconclusive,” for objects that cannot be fitted satisfactorily into an existing niche. There would be no rejections, only positive assignments to a particular status. In the absence of any such instrument for providing a structured response, the Van Gogh Museum gave Bouwe Jans a categorical No, which it justified with an unfortunate variety of reasons. In January 1996 it wrote that the style is uncharacteristic, the colors different from those in known works; the drawing clumsy and mechanical; the weave of the canvas unknown; the paint thin. In June 1998, new arguments were added: the gray color of the ground does not exist in van Gogh’s Dutch period; the occurrence of cadmium yellow is a counter-indication, since it was an expensive pigment; the brushstrokes are not individually recognizable, as they are in the accepted works; the figures are outlined in a way never practiced by the artist; the signature is not convincing. All of these reasons were put on paper by the museum before anyone there had seen the painting. When they did see it, in 1999, they sent Jans a curt note to say that they had nothing to add to the opinion they had formed on the basis of photographs. As Jans demonstrates in his book to my satisfaction, none of the reasons adduced by the museum is adequate for rejecting a painting from a period when van Gogh was still experimenting, a period of which we know that most of what he made has disappeared, and one which does not seem to have attracted forgers in the 19th century, when this work was made. The museum’s arguments reminded me of the overconfident attitude of Bernard Berenson, who said under oath: “… when I see a picture, in most cases I recognize it at once as being or not being by the master it is ascribed to; the rest is merely a question of how to try to fish out the evidence that will make the conviction as plain to others as it is to me.” Because the curators of the museum did not recognize Jans’s painting as a van Gogh, they were sure that nothing about it could be right, and had no hesitation in saying so. Jans himself learned the wrong lesson from his experience, which in Artquakes is filled out with other entertaining tales of the inconsistency of van Gogh connoisseurs. What his conclusion boils down to is that the specialists who disagree with him and reject his painting are arrogant poseurs who do not know what art is, while those who accredit his find as a van Gogh are “genuine experts” who are moreover courteous to a fault. What I derived from his story is something else. Namely, that nearly no one in the attribution game is willing truly to let the evidence speak for itself. Everyone is out to defend, with as scientific-sounding arguments as possible, convictions that are formed in a distinctly non-scientific way. As long as this kind of pretense is still accepted, there will always be new sagas of Bouwe Jans. © 2002 Gary Schwartz. Published in Loekie Schwartz’s Dutch translation in Het Financieele Dagblad, Amsterdam, 19 January 2002. This year an honorary doctorate was given to Eddy de Jongh, one of the most original and influential art historians of our time. The university auditorium in the Oude Lutherse Kerk was full to the rafters with colleagues, fans and friends of the three honorary doctors, mainly those of Eddy. We saw it not only as an award to him but also as a sign of recognition for our field. In his elegant five-minute speech of thanks, Eddy felt called upon to defend art history. In fact, the teaching of Dutch art at the University of Amsterdam is in something of a crisis. The professorship in that field has now been filled after a gap of several years, with the appointment of Eric Jan Sluijter, who had been a lecturer at Leiden University for many years. However, the university has diluted this chair by sharing it with the Institute of Fine Arts of New York University, where Sluijter will be teaching for one semester a year. The NYU chair is therefore also downgraded in this arrangement. The blackmailing argument by which this deal was pushed through was that neither university would appoint a professor for the study of Dutch and Flemish art at all unless the post was shared. Be that as it may, it’s time to celebrate. The Amsterdam Center for the Study of the Golden Age has put together a nice program in honor of the honorary doctorate for the afternoon of January 25th, in the Noorderkerk. (http://www.codart.nl/2002.html#0125amsterdam_noorderkerk).